As summer winds down, new students from all over the country and the world are beginning to arrive on campus for an event-filled orientation. With exams, problem sets, and essays aplenty in the coming fall, where they live at MIT is an important decision that incoming freshmen have to make. 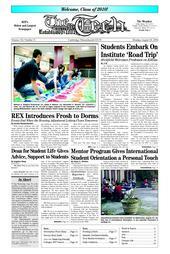 Residential Exploration (REX) is giving freshmen the opportunity to explore the 11 undergraduate dormitories. Staff reporter Valery K. Brobbey is an international student from Ghana and was a mentor in this year’s International Freshman Mentor Program. When you first arrive at MIT, the dining options on campus and numerous restaurants located in Cambridge and Boston can make it easy to avoid the kitchens of your dorm or living group. The Housing Lottery placed everyone in the Class of 2010 in their top three dormitory choices. 70 percent received their first choice, 23 percent received their second, and 7 percent received their third. These numbers are comparable to last year’s, with 70 percent, 26 percent, and 4 percent of the Class of 2009 receiving their first, second, and third choice dormitories, respectively.